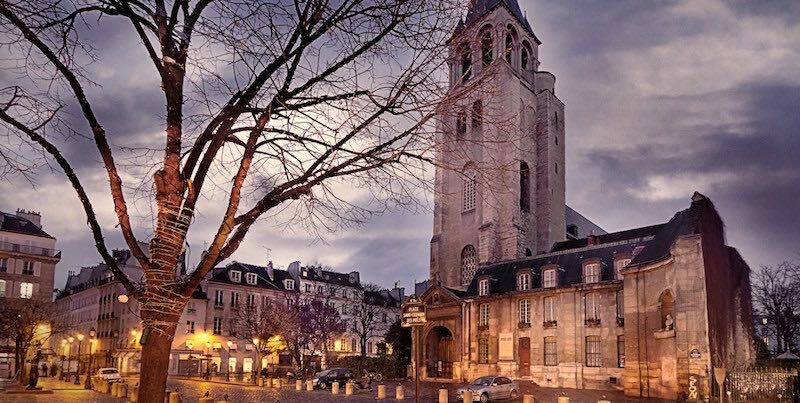 Saint-Germain-des-Prés, the 6th Arrondissement of Paris, is best known for the literary and artistic celebrities who lived and worked here in the late 19th and early 20th centuries. It was the meeting point for existentialists, painters, and writers. Today, once the most literary of Paris arrondissements is one of the best shopping destinations in the city. If you stay in St-Germain everything is at your doorstep — cafes, brasseries, bars, and restaurants flourish, including the famous Cafe de Flore, Les Deux Magots, and Brasserie Lipp. You also find art galleries, antique stores, theatres and cinemas, street markets, Jardin du Luxembourg, clothing retailers, and Le Bon Marche. 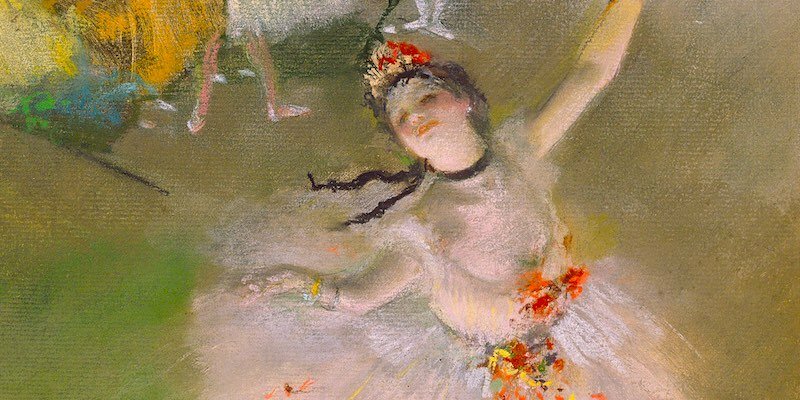 At this dedicated museum you can explore the great French painter's life, his artwork, and his studio. On display are many of Delacroix's early works including small oil paintings, pastels, and sketches. In case you've forgotten your French art history, Delacroix (1798 – 1863) is regarded as the leader of the French Romantic movement in art. He took his inspiration from Rubens and Venetian Renaissance painters who focused on bold colors, sensuality, and a sense of movement in their works. 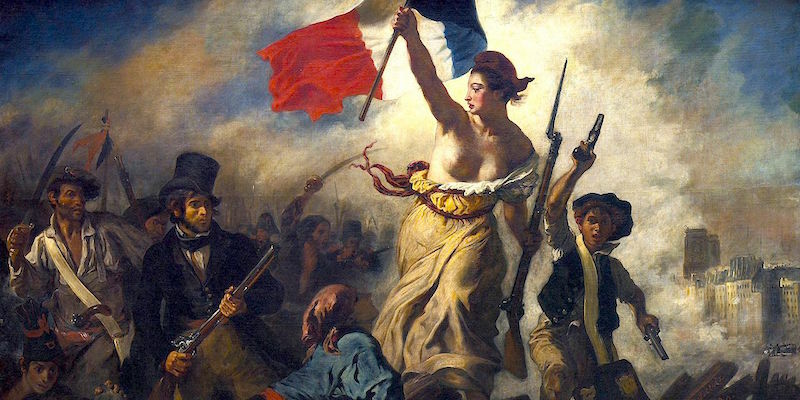 You probably could identify his most famous painting, Liberty Leading the People, which hangs in the Louvre-Lens museum in northern France. Musée Delacroix in St Germain is set in the last apartment he lived in. It was good news for art lovers in 1929 when the Société des Amis d'Eugène Delacroix fought to prevent the destruction of the apartment building. The structure was eventually donated to the French government and it became a national museum. Hark back to French philosophical history by taking breakfast at this famous literary cafe. Sure, it may cost a little more than other Parisian cafes (and it may be just a week touristy), but the air of history is palpable and worth the extra euros. 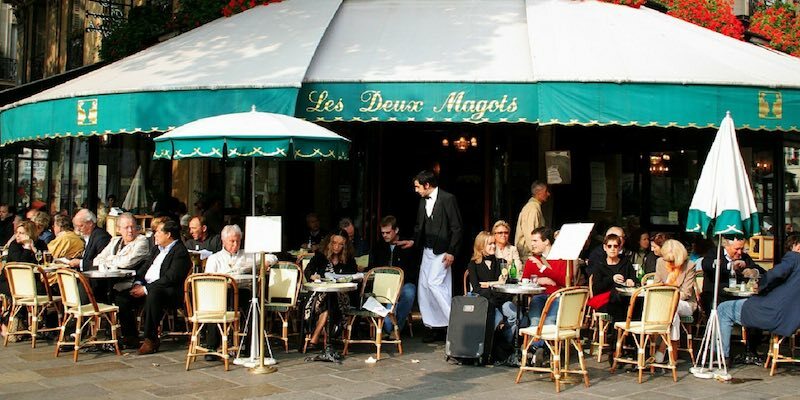 In case you're wondering, the name Les Deux Magots has nothing to do with maggots. It refers to two Chinese wisemen (derived from "magi") and was the name of the gift shop that previously occupied the building. The cafe was first established in 1812 at Rue de Buci and moved to their current address in 1873, in the period when the grand Paris boulevards were being created. Today you can stop for breakfast (petit dejeuner), a plat du jour for lunch, or for just a drink. Come for French comfort food — brandade de cabillaud, pot au feu de boeuf (with the marrow), confit de canard, or just to have a cafe creme and brood for a while. Think back to the people who just may have sat in the same seat as you — a young Ernest Hemingway, James Joyce, Bertolt Brecht, Simone de Beauvoir and Jean-Paul Sartre, even Julia Child. Like her famous neighbor, Les Deux Magots, Cafe de Flore first opened her doors in St Germain in the late 19th century — 1887 to be exact. During the 1920s and 1930s poor artists and writers and revolutionaries who lived in small, unheated apartments would gather at Flore to get warm and to discuss their ideas. People like Pablo Picasso, Albert Camus, Leon Trotsky, Ossip Zadkine. They didn't just stop in for a drink, cafes like Flore were their offices and second homes. 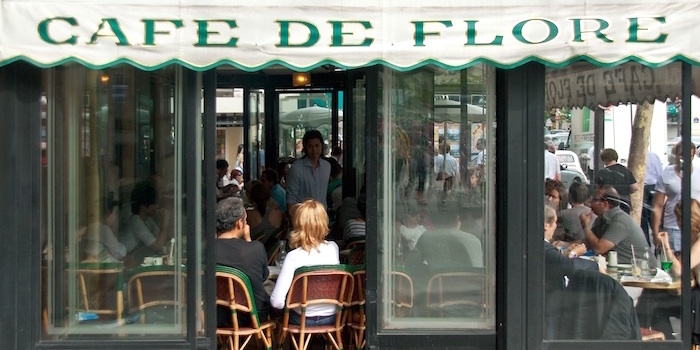 Jean-Paul Sartre talked about arriving at Cafe de Flore at 9 AM and working until noon. Then he and Simone de Beauvoir would go elsewhere for lunch, return to the cafe by 2 PM and work until dinner. Afterwards they would return to the Flore for a nightcap. In the 1960's Cafe de Flore was the hub for New Wave celebrities Bridget Bardot, Roman Polanski, Yves Montand, Jean Seberg; and fashion icons Yves St Laurent, Hubert de Givenchy, Karl Lagerfeld, and Paco Rabanne. Today, you might not want to linger all day but you could start your day at Flore with a croissant au beurre, an oeuf dur (hard boiled egg), jus d'orange, or chocolat special Flore. 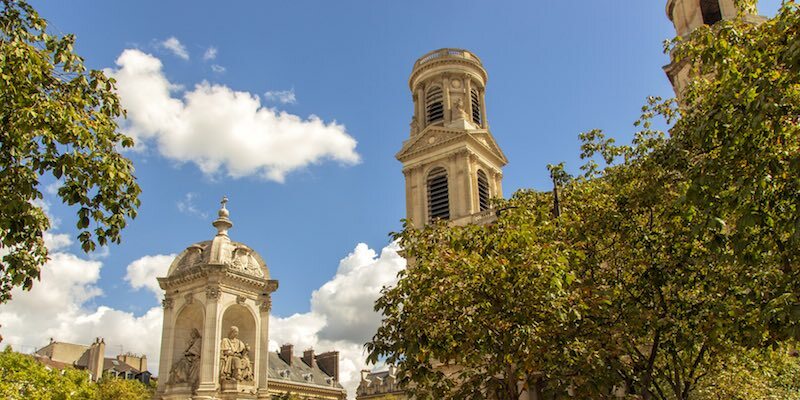 This 17th-century church, very near Jardin du Luxembourg, is located on a place with a beautiful fountain. Famous for having the only fresco painted by Delacroix, Jacob Wrestling with the Angel, and for its Grand Organ. The da Vinci Code (both book and movie) set much of its action in this church, based on the supposed secret meanings hidden in the architecture. There is, though, a wondrous gnomon, or sundial, set into the floor, along with other fascinating patterns. Saint-Sulpice is certainly worth visiting and exploring. By the way, did you know it's the second-largest church in Paris? Nestled in the vast gardens of the Jardin du Luxembourg, the museum was the first in France to be open to the public, back in 1750. You won't find a permanent collection, instead there are two or three changing exhibits per year. 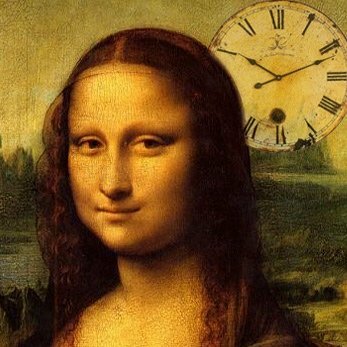 At one time, the museum housed paintings by Rubens, da Vinci, Titian, Rembrandt and Raphael before they were moved to the Louvre. If you love the good life as much as we do, the minute you land in Paris you will make a bee-line to Le Bon Marche. Over the years, we've watched the grand magasin and only department store on the Rive Gauche (Left Bank) evolve and flourish. 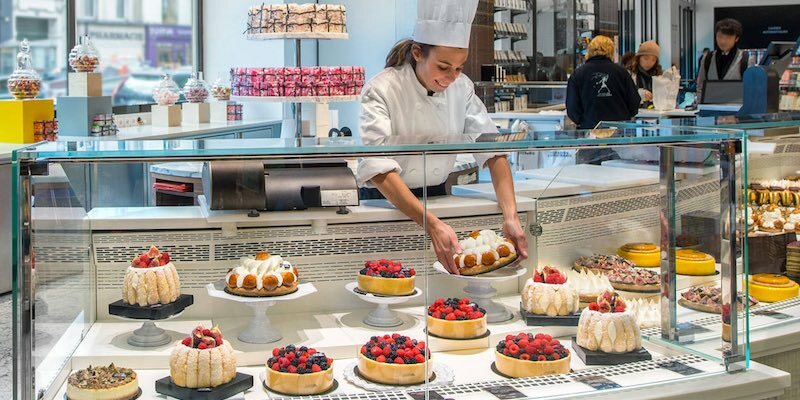 Of course, who doesn't enjoy perusing the luxury brands in Le Bon Marche department store, but our hearts belong to the best grocery store in the world, La Grande Epicerie de Paris, found just across the street from the main branch. La Grande Epicerie is the place to gather your Paris pantry essentials — fleur du sel, cured meats, heady cheeses, delicate pastries. It's also our pick-me-up place where we take a break while shopping to down a few oysters and a glass of Sancerre. The wine store (found on the lower level) is fully stocked with wines of France, and the upper levels are a sort of Disneyland for food lovers and cooks, resplendent with the finest cooking utensils, French cookware, tableware and other culinary delights. 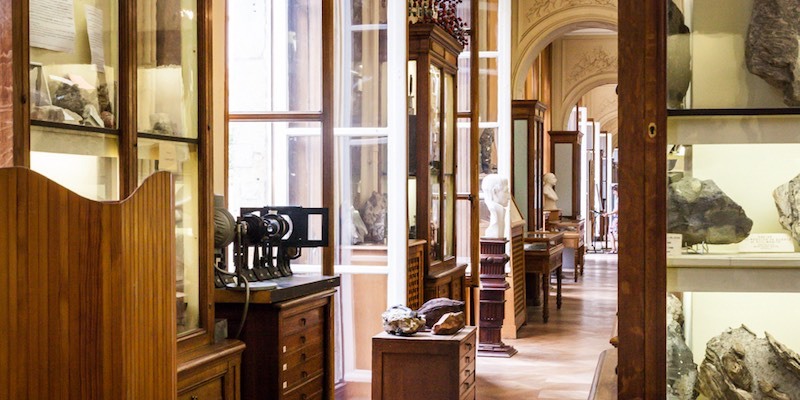 The Museum of Minerals has to be one of the most hidden and obscure museums in Paris, although it's hiding in plain sight in the middle of the bustling Boulevard Saint Michel. It's a seriously old museum, dating back to 1783, with a vast collection of 100,000 mineral specimens. While the topic may not be to everyone's taste, the museum does have a French following. Its website shows photos of then-president Hollande admiring dazzling minerals on a visit. The museum also has temporary exhibitions, currently on display as we write this are the French Crown Jewels. Although he now has boutiques all over the world, we have a soft spot for the shop on Rue Bonaparte in St Germain in Paris. 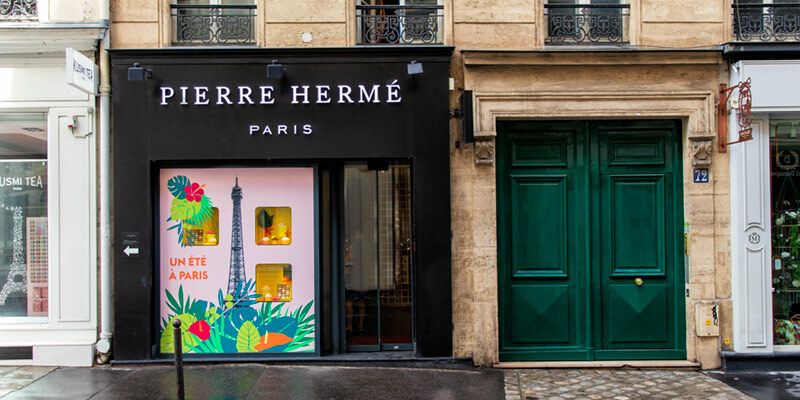 Pierre Hermé has the pastry pedigree of legend — he comes from a long line of pastry chefs (four generations) and started his apprenticeship at 14 with Gaston Lenotre. He opened his first shop in Tokyo and his second location in St. Germain. What makes Hermé such a genius in the world of desserts is his revolutionary approach — treating sugar like salt and using unusual combinations of flavors. If you taste anything at his shop, make sure it's a macaron; Hermé is especially fond of his chocolate macarons. If it's your first time, try the signature Ispahan made with rose, raspberry and litchi. Pierre Hermé is the only pastry chef to receive the highest French honor — Chevalier de la Légion d'Honneur. Don't you just love France? Does it seem to you, too, that we spend a lot of time talking about the food to be had in St Germain? But, then again, we do the same about all of Paris! Here's Brasserie Lipp, a Paris institution since 1880. A little bit touristy, a little bit rock and roll. A meal at Brasserie Lipp will whisk you to a different era. 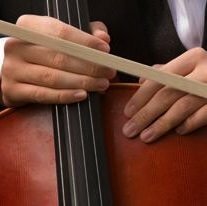 (Whisk?) The service is brusque and sometimes efficient, the food is classic French, the overall experience makes you feel like you're in the center of a movie set, or flung back a century or two. Is that Hemingway at the next table? We love their days-of-the-week menu, called Le Semainier, with a different specialty each day. Monday is black-pepper steak (pave de boeuf au poivre) or poached haddock in beurre blanc. Tuesday is roast lamb or blanquette de veau a l'ancienne. If you're a fan of cassoulet make your reservation for Thursday. They are open daily, the only exceptions are Christmas and New Year's Eve. The national school of architecture, painting and sculpture was founded just after the French Revolution and has graduated a who's-who of the French art world — Jean-Auguste Ingres, Edgar Degas, Mary Cassatt, Gustave Moreau, Georges Seurat. Every year in June or July there is an open house when you can see the studios as well as works by the students. You can still order Marie's favorite chocolate: Pistoles de Marie-Antoinette, dark chocolate (99%) with various flavors like almond, coffee, orange tree flowers. It's recommended to enjoy the chocolates as did the tsars of Russia, with strong spirits. In a small park just around the corner from Debauve & Gallais you can spot a bust of the Ukrainian poet Taras Shevchenko. In fact, the park is also named for this national hero — Square Taras Chevtchenko (using the French transliteration of his name). Shevchenko's writing had such an impact that today he is regarded as the father of Ukrainian literature and even of the modern Ukrainian language. He lived from 1814 to 1861 and is still held in esteem by Ukrainians and those of Ukrainian heritage around the world. 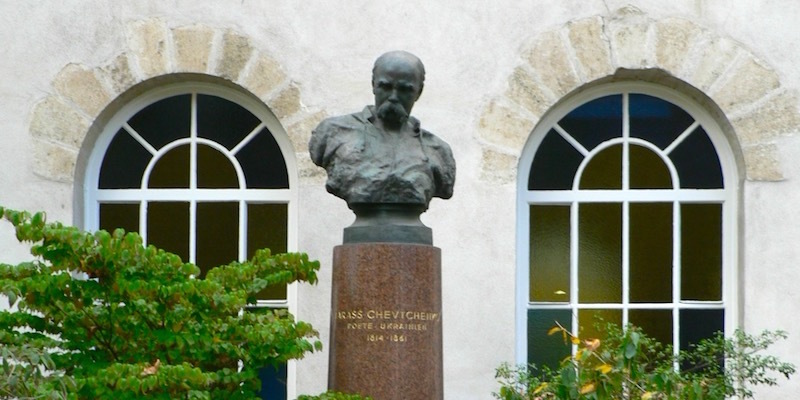 The Paris square was dedicated in 1937 and the bust by Lyssenko was erected in 1978. If, like us, you consider chocolate a major food group, then St Germain should top your list of must-visit neighborhoods in Paris. Sure there's the oldest chocolate shop, but there's also a plethora of chocolate shops on virtually every street in St Germain. Other favorites of ours are Pierre Cardolini, Patrick Roger, Pierre Hermé (of course), Ladurée, and Gerard Mulot. 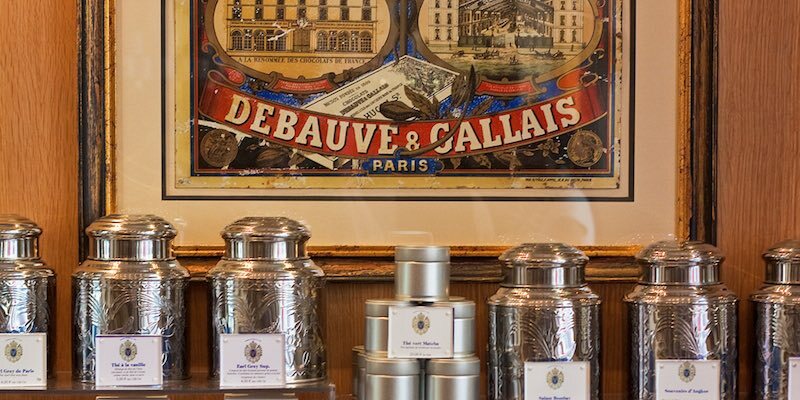 It's no wonder that one of the most popular activities is a St Germain chocolate walking tour. We had fun on this guided tour that takes you into the world of French chocolate in the neighborhood where it tastes most heavenly. 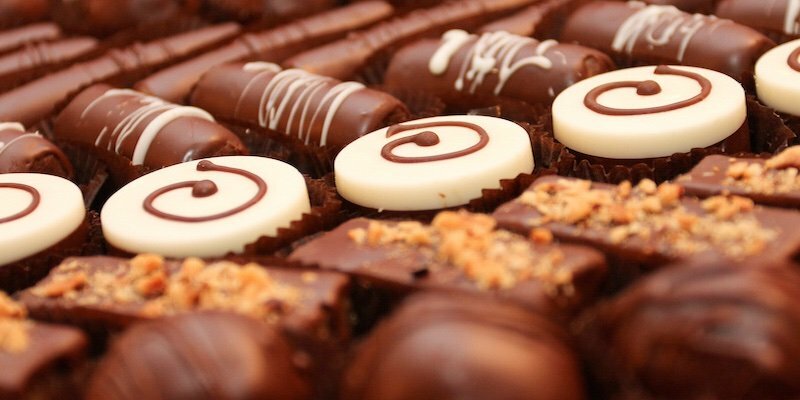 Did you know that the French eat over 400,000 tons of chocolate a year? Find out why. The year is 1612 and Marie de Médicisis the queen of France. She buys an estate and transforms it into the Luxembourg Palace surrounded by acres and acres of royal gardens. The gardens were made to resemble the Boboli gardens in Florence. Suddenly, the neighborhood (a combination of Latin Quarter & St Germain) becomes a fashionable district for French nobility to settle in. Today, Marie's garden is more popular than ever. 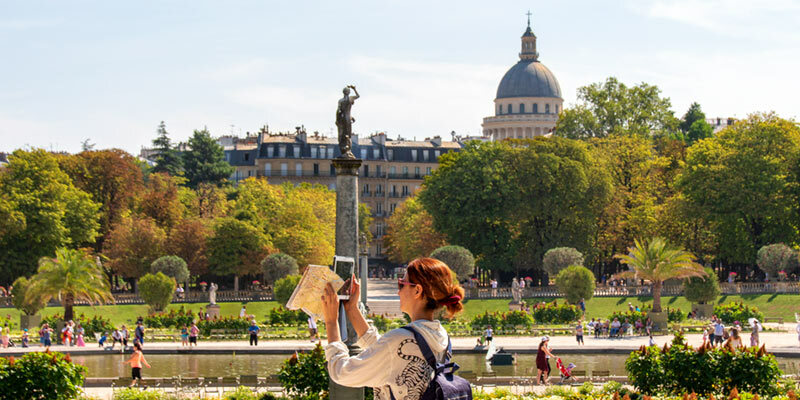 Orchards, rose gardens, an apiary, the Medici fountain, a playground, tennis courts, puppet shows, pony rides, cafes, a museum, a pond — the Luxembourg garden seems to have it all! St Germain's main Metro line, the mighty Line 4, stops at Saint Michel, Odeon, St-Germain-des-Prés, and Saint-Placide. Line 4 is a major link between the north and south, stopping at three of the major Paris train stations — Gare de Nord, Gare de l'Est, and Gare Montparnasse. 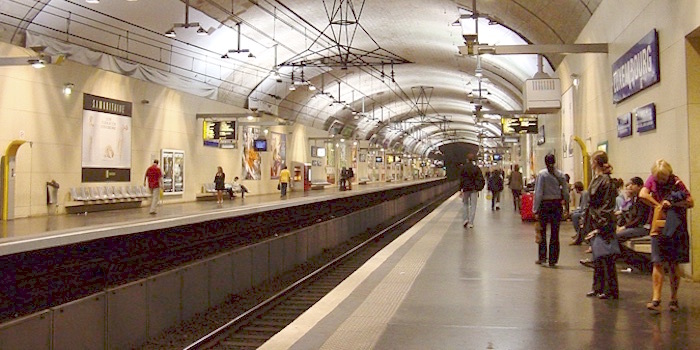 RER Line B has stations at St-Michel and Luxembourg, RER line C is accessible at St-Michel, Metro line 10 from Odeon, and Metro line 6 from Raspail. These are three wonderfully romantic bridges. Pont Neuf, the oldest bridge in Paris, links St Germain to the tip of Ile de la Cit. 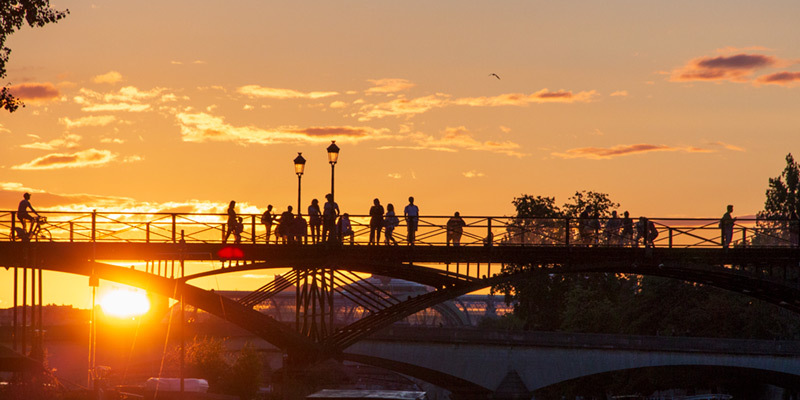 Pont des Arts, a pedestrian bridge, that takes you to the Louvre. Pont St Michel takes you from St Germain to the very belly of Île de la Cité. 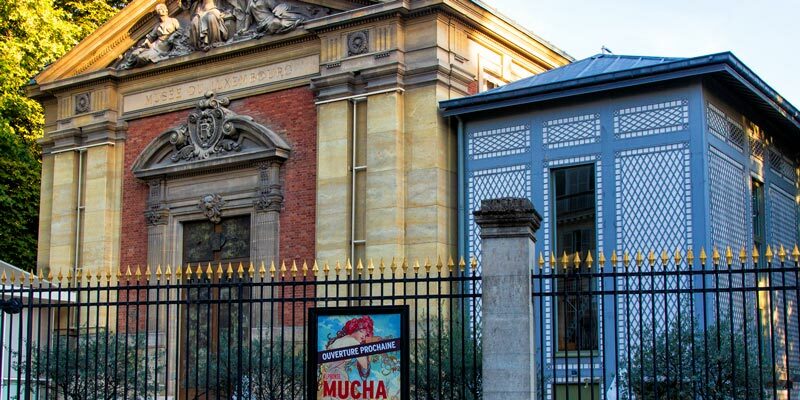 We really like the small artist museums that dot the Paris landscape. 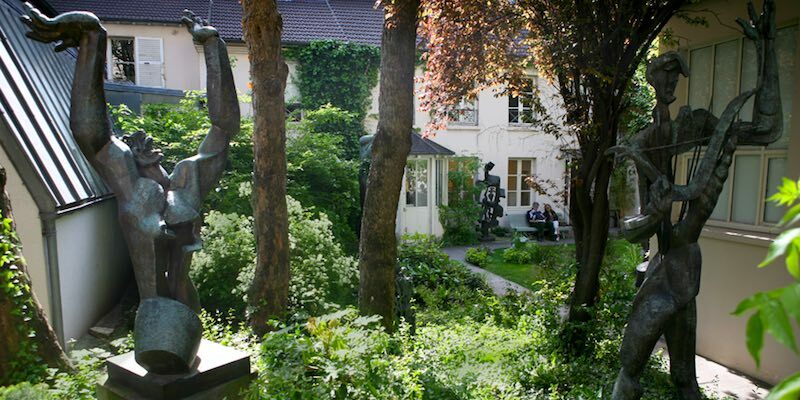 The Zadkine museum was the home studio of Ossip Zadkine (1890 – 1967), a Russian painter and sculptor who lived and worked here from 1928 until his death. It's thanks to his widow, Valentine Pax, who donated their estate to the City of Paris, that his works are displayed where he created them. With glass roofs and a garden, the museum is a haven of peace and quiet in the hubbub of Paris. Entry to the museum is free. One of only six national theatres in France, the Odeon Theatre stands majestically on the place that bears its name. The Greek-inspired theatre was inaugurated in 1782 by none other than Marie Antoinette. Today the theatre performs a regular season of plays from September to June. The place is a great place to sit and relax on your way to the Jardin du Luxembourg. 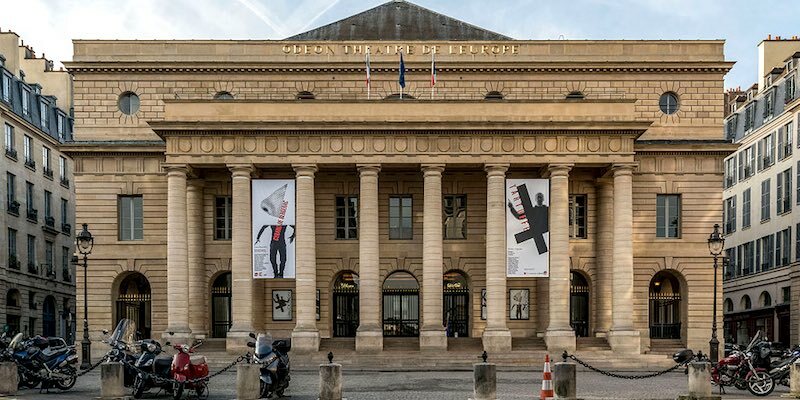 There's also a few wonderful restaurants nearby, including La Bastide Odeon and La Méditerranée, opened in 1942, with a logo designed by Jean Cocteau. You know now that St Germain is a fascinating neighbourhood, so it probably won't come as a surprise to learn that there are some pretty darn good hotels in the quartier. All of them are in great locations within St Germain and receive our top ratings of "Superb" and "Highly Rated Plus". 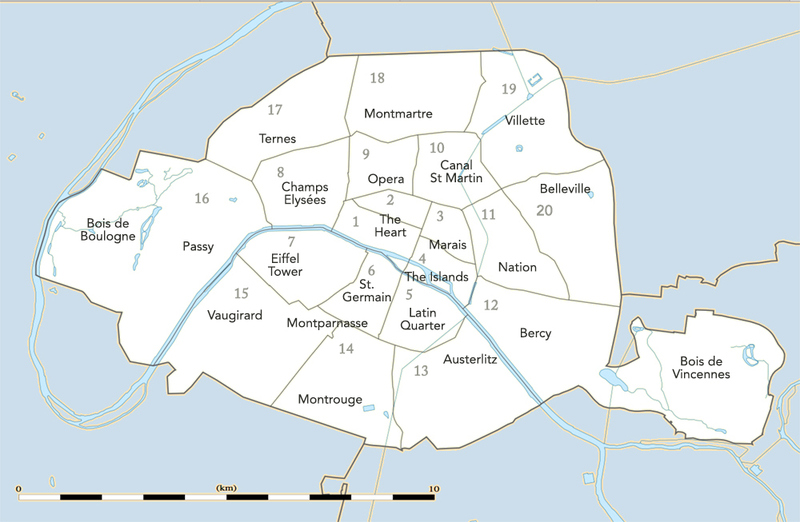 There are four quartiers, or distinct neighborhoods, within St Germain — Notre Dame des Champs, Odeon, Monnaie and Saint Germain des Pres. The main street is Boulevard Saint Germain. It runs one way, to the east. The district is served mainly by Metro lines 4 and 10. Picasso, Hemingway, Sartre, and Baudelaire lived and worked in St Germain. After Picasso left his wife Olga, he lived at his studio at the 17th-century Hotel de Savoie on the Rue des Grands Augustins. 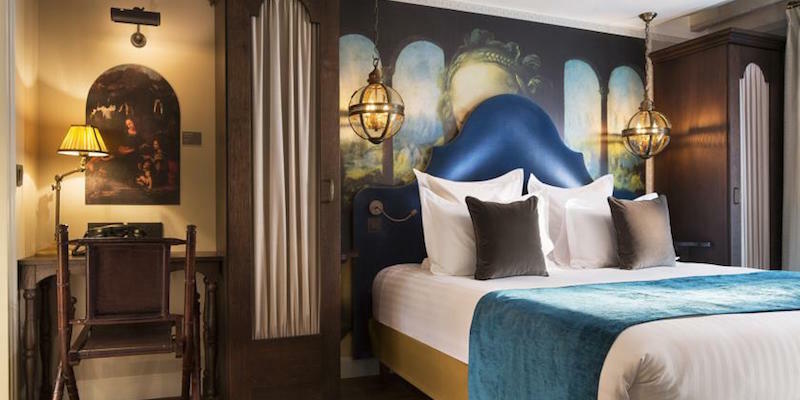 Other Famous Residents of St Germain included Richard Wagner, who lived on rue Jacob, and Oscar Wilde, who stayed at what is today the luxurious l'Hotel. Wilde died there on November 30, 1900 at the age of only 46.